Maria is on board of NOAA’s R/V Nancy Foster Research Ship and I’m fully enjoying the experience! 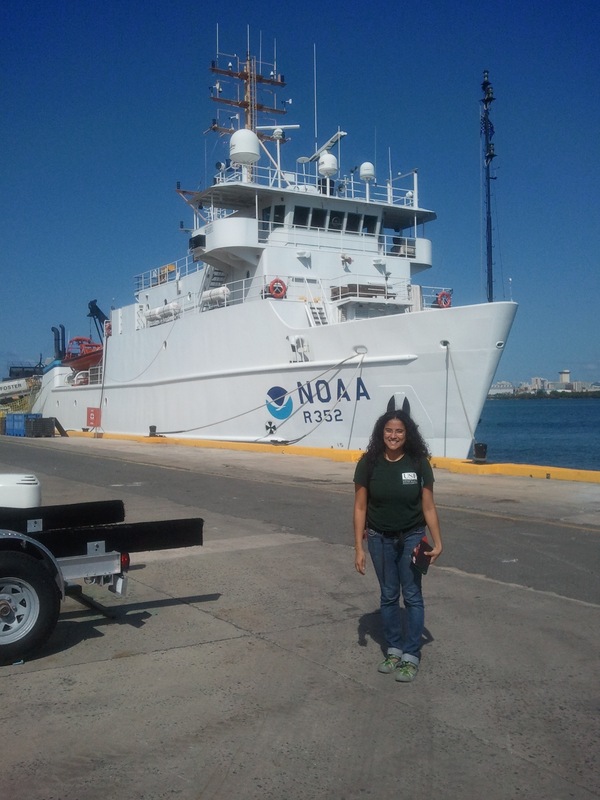 I’m part of the scientific crew that are collecting physical and biological data to look at the connectivity of larval fish through the Caribbean. This is part of NOAA’s Coral Reef Ecosystem on-going interdisciplinary research project that obtains biological and physical oceanographic surveys of the Virgin Islands (UVI) bank ecosystems and it surroundings. The long-term sustainability of fisheries in these banks will depend on the understanding of the transport, spawning aggregations and overall larval recruitment in these waters (project’s objective). The participating agencies are NOAA Atlantic Oceanographic and Meteorological Laboratory (AOML), NOAA National Marine Fisheries Service, University of Virgin Islands, Autoridad Nacional de Asuntos Maritimos, University of Puerto Rico and the University of South Florida. To track our journey through the Caribbean please refer to the link posted below. It’s taking real-time GPS coordinates of the ship!